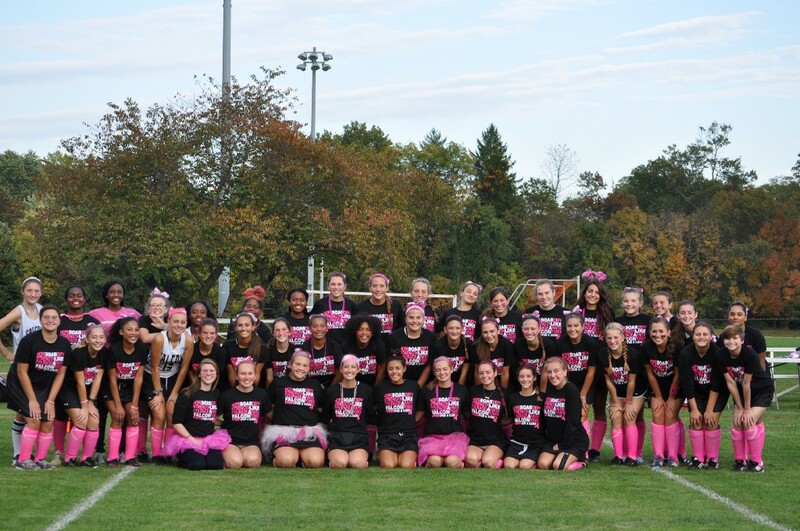 “Members of the Burlington Township Girls Field Hockey team during the 2016 Play4theCure activities.” Photo Credit to Mary Ellen Guzdek. One in eight women will be diagnosed with breast cancer in their lifetime. October is dedicated to breast cancer awareness and trying to inform others about the serious disease. The Burlington Township High School field hockey team and several of the players’ parents are preparing for the annual “Play4theCure” game, set to take place Oct. 11 against Pennsauken High School at Green Acres Park. The junior varsity game is scheduled to kick off at 4 p.m. with varsity scheduled for 6:30 p.m. The rain date is scheduled for Oct. 12. The game, which is also the team’s senior night, is a fundraiser to help raise both awareness and money to fight breast cancer. Guzdek has been helping to organize the event for the last three years, and her daughter, Gabrielle, is a senior for the Lady Falcons. Other parents had taken on this responsibility before Guzdek, and others will continue the tradition after this year. Leading up to the event, the team sells T-shirts, hair bows and pink pumpkins that are donated by Johnson’s Locust Hall Farm and decorated by team members. The school district holds a teacher dress down day, while concession stand receipts and donations made by the school also are included. An estimated 500 people attended the event last year, according to Guzdek, and the crowd could increase in 2017 with a JV game added to the day’s schedule. In 2016, there was a 50/50 ticket raffle added, and in 2017 there will be a new idea added to the plans. Increased technology has helped the event become advertised by more than just word-of-mouth. Facebook, Twitter and many other social media outlets have allowed the members of the team to notify friends in other towns about the fundraiser. Checks and donations can also be sent to 89 Jennifer Lane, Burlington 08016.